After the 2002 Drummers’ Heritage Concert my wife and I invited a few of the participants to our hotel room for some R & R. Besides the pleasure of their company, I had an ulterior motive for gathering these gurus of field drumming. For many years a question had rankled my brain and now this assemblage offered a chance, perhaps my only one, for my question to be definitively answered. Among others our invitees included Alfons Grieder, world renowned Swiss Basel drummer; Dennis DeLucia. 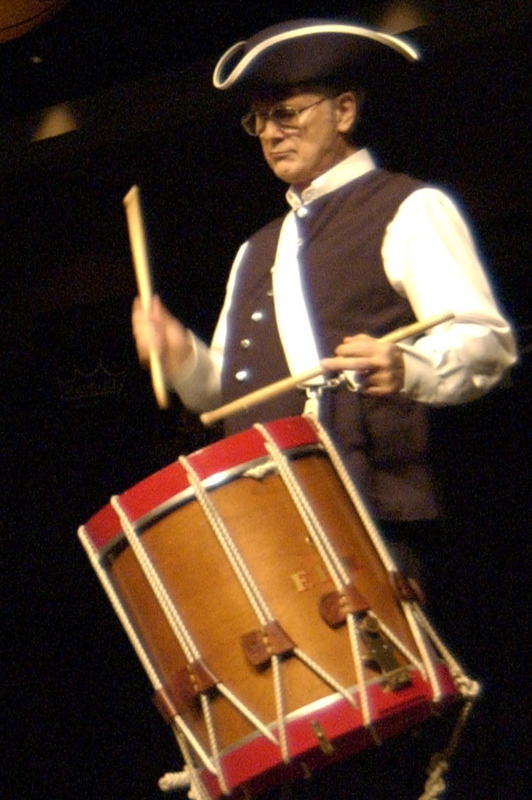 our concert moderator and himself a famous rudimental player and teacher; John S. (Jack) Pratt, legendary player and composer of “14 Modern Contest Solos”; and Doug Stronach, renowned teacher, and Scots drumming master. The majority of these artists had never before met though most had heard of each other. After we all settled down and smiled a bit self consciously someone, I think it was Doug Stronach, asked why the Swiss drummers play the way they do – the strange wobble at the end of every measure? Jack Pratt was first to jump in with an answer. “I’ve heard this is the result of drummers growing up in a mountainous country. One foot is always lower than the other and so they developed this style from hobbling around the mountains while trying to play drums”. There were a few giggles and then Alfons Grieder spoke. “I’ve always been told and always believed we play this way because beginning students hesitate before going over the bar line into the next measure”. Alfons was obviously serious. No giggles in the room this time. 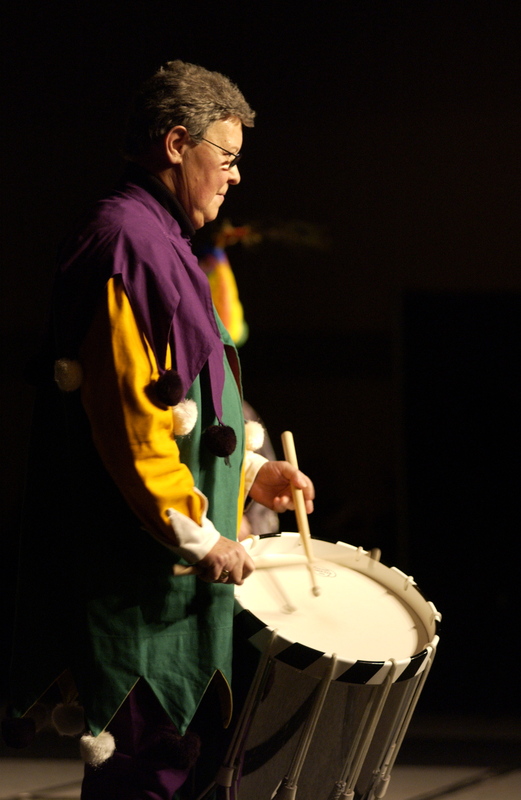 It seems one of our most honored drum traditions had developed because of student insecurities. Everything was quiet for awhile so I decided this was the time to ask my question. “Why do many North American military field drummers hesitate before starting a 7 stroke roll that ends on a downbeat?” To demonstrate, I whistled the Yellow Rose of Texas, and accompanied myself by playing sevens on my knee. Jack Pratt was again first to speak. “We do it because we can”. And again the room was quiet. No rebuttals. Another master had spoken and I let the matter drop. Perhaps we dig to deeply, Sometimes answers are simple. A few years later Jack and I had the pleasure of playing “Gingersnap” one of his greatest solos. We warmed up together in an Eastman school of music practice room. During our session I complained to Jack about his 7 stroke rolls. “Am I being a bad boy?” Jack asked. “Yes” I said. “ It’s not that you’re hesitating on the sevens, it’s that you’re hesitating more and more as the piece goes on and I don’t know how to follow”. “I’ll be a good boy” Jack said. At concert time he was better then good. I doubt if I contributed much to the performance, but I managed to keep up with him. Playing with Jack that day is one of my fondest memories. Looking over our shoulders were members of the United States Military Academy Field Music Unit “Hellcats”, a group Jack had led more than 30 years earlier. One of the “Hellcats” was David Smith (the younger) a former student of mine. For those of you who may not be familiar with the hesitating style of playing 7 stroke rolls, click on the audio file below to hear the Lancraft Fife and Drum Corp of North Haven, Connecticut. NEXUS WORLD TOUR – 1984 – A DIARY, Part 14. JAPAN, Takemitsu and WE. NEXUS WORLD TOUR – 1984 – A DIARY, Part 13. Japan, Takemitsu and friends. Concerts in Toronto – No. 3, October 28, 2015. NEXUS WORLD TOUR – 1984 – A DIARY, Part 12. KBS Concert and Hanyang University.